Metasequoia, a deciduous conifer, and one of the common fossils found in many of the Eocene sites of the Pacific northwest, flourished in Oregon's forests for millions of years. In honor of this long history, Oregon has named it their official state fossil. Metasequoia were first described from the Mesozoic from Shigeru Miki in 1941. Miki, thinking they were long extinct was surprised that his 'fossil first' had living relatives. The "dawn redwood" was rediscovered in China in 1941 in Modaoxi. The excitement of the find was diminished by the heating up of World War II. In 1948, Wan Chun Cheng took up their study with fellow scientist, Hu Hsen Hsu, with a study and a replanting program. Harvard University was asked to participate and brought back a collection of seeds and seedlings to distritute to various universities and arboreta worldwide. 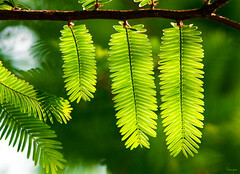 Today, the dawn redwood can be found growing in temperate environments across North America and the rest of the globe. Two of my friends, Mike and Cory, raise these "fossil seedlings" for friends and paleo enthusiasts. Sadly, I tend to underwater for extended periods of time, which has disasterous effects even on this small study sample. Even so, several of the hardiest seedlings grace my yard, adding a bright, fresh green and Oregon's official fossil to the garden. This year, I'm starting a few seedlings of my own to plant on Earth Day 2010!